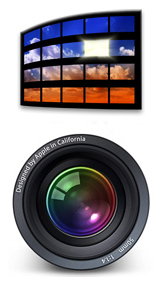 How would you like to own a complete, unaltered chapter from the just-released iPhoto 6: The Missing Manual that covers two of iPhoto's 6 newest features: photocasting and iWeb publishing? For free! You can right now by visiting the O'Reilly iPhoto 6 catalog page and clicking on the Chapter 9: iWeb, Photocasting, & Network Sharing (PDF Format) link. This PDF download is 35 pages and a 7.4 MB download. You'll learn everything you need to know about sharing your images via RSS (photocasting), building iWeb pages from your iPhoto 6 library, and iPhoto's networking capabilities. 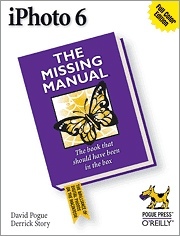 O'Reilly Releases "iPhoto 6: The Missing Manual"
"Don't let the rumors fool you. iPhoto may be simple, but it isn't simplistic," say David Pogue and Derrick Story. "It offers a wide range of tools, shortcuts, and database-like features; a complete arsenal of photo-presentation features; and sophisticated multimedia and Internet hooks. Unfortunately, many of the best techniques aren't covered in the only 'manual' you get with iPhoto--its slow, sparse electronic help screens." That's where their new iPhoto 6: The Missing Manual (Pogue and Story, O'Reilly) comes in: it's the iPhoto book that should have been in the box and a complete course in digital photography. Dramatically faster than previous versions, iPhoto 6 can handle 250,000 photos and boasts dozens of new features for storing, searching, editing, publishing, and sharing digital pictures. In full color, this authoritative, witty guide delivers the technical expertise to take advantage of each and every iPhoto detail, as well as the artistic know-how to shoot consistently great photos--including professional tips for composition, lighting, and manual exposure. iPhoto 6 continues to impress casual and serious photographers alike. In an recent interview with Scott Bourne on Photofocus Radio, Derrick Story, co-author of iPhoto 6: The Missing Manual discusses with Scott the new features in version 6, including Photocasting. The interview begins about half way through the show. Scott also covers news in the world of photography and provides a hands-on review of Apple's MacBook Pro. Lots of good stuff to listen to. You can download the show here or visit Photofocus.com and click on the April 8 entry. The folks at Alien Skin Software market their latest Photoshop plug-in, Exposure, as a film simulator. That's right, they've analyzed dozens of film stocks and brought those unique characteristics to your digital photos. So if you're in the mood for the vivid colors of Velvia or those rich Kodachrome blacks, you can have them with just the click of a mouse. Where Exposure really turned my head though was how effortlessly it handled Black & White emulation. Most of my favorite films were there -- Tri-X, T-Max, Delta 100, Neopan, and HP5 -- and they look great. Never has film grain been such a welcomed sight. And unlike the old days, I can control the grain in the shadow, midtones, and highlights... and even the size of the grain itself. The Alien Skin presets for the different film stocks are all you'll probably ever need, but if you really want to tinker, they can be the starting point for you creating your own film stock (and saving it for future use). Needless to say, Exposure is a terrific B&W converter for your digital images. Not only will they look like "real" B&W photos, you have an array of "film looks" to choose from. Print one of these conversions on a quality B&W printer, such as the Epson R2400, and you'll never yearn for the stench of Rapid Fixer again. You have all sorts of additional controls beyond film emulation, such as curves, sharpness, and toning. There are some nice UI features such as a variety of split preview panes to choose from, a toggle button to see the original photo, and a magnifier. All of this functionality and convenience comes at a price however; Exposure will set you back $199. To decide if you think it's worth the money, you can download it and play with a fully functional version for 30 days. I recommend that you give Exposure a try. It works on both Mac and Windows platforms. The Epson R2400 is the new workhorse printer for the Story Photography studio, beating out the latest offerings from Canon and HP. I had a chance to get to know the R2400 during this past rainy weekend, and I thought I pass along my first impressions. I based my buying decision on a few key factors. First, I was impressed with the new UltraChrome K3 inks. They are beautiful and take archival permanence to a new level... 100 years plus. 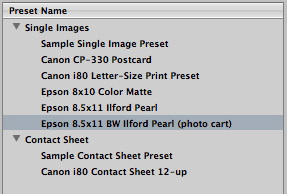 Second, Epson's downloadable ICC Printer Profiles enable me to get perfect color matching right out of the box. Why every printer manufacturer doesn't provide these is beyond me. 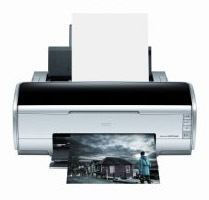 Third, Epson's printer software for both Mac and Windows is excellent and easy to use. And finally, the B&W output from the R2400 is gorgeous. The R2400 comes with a FireWire cable, but since I'm often printing from a PowerBook that only has one FireWire 400 port, I opted to use my own USB cable. The printer works equally well via FireWire or USB 2.0. A full set of K3 cartridges comes with the unit, so you can fully set up and test without having to buy ink. I have an extra set, but after a weekend of printing both B&W and color, I haven't had to replace any of the 9 colors yet. If you like to print on matte surface, as I do, keep in mind that you have to switch one of the cartridges to do so. I recommend that you batch your printing to reduce the need to swap out cartridges. It only takes a few minutes for the R2400 to go through the reset process when you make a change. That's not forever, but it sure feels like it when you're anxious to make a print. The paper feed is wonderful, and I was able to easily print on a variety of surfaces without a single jam. The top loading feature, even for 13" x 19" papers, is a true convenience and space-saver. Finally, the output is outstanding. Accurate color, no smears, true photo quality, and fast printing speed. The R2400 will set you back about $800 plus $14 per cartridge. That's a lot of money for casual printing. But if you like making your own fine art enlargements (up to 13" x 19") and want prints that last for a long, long time, this is a highly recommended printer. Aperture enables you to create presets for many of its functions including saving custom print output settings, slideshow transitions, and creating your own file export configurations. Much in the same way that your Photoshop actions become invaluable assets, so will your Aperture presets. In fact, if you were to lose those presets, or move to a new installation of Aperture without them, you'd feel the pain of having to recreate all that work. I recommend that you automate backing up your Aperture presets so that you always have the latest settings available. Since I have a .Mac account, I can use Backup to automatically store my latest presets online. I can then retrieve them for a new installation or for restoration after a crash. 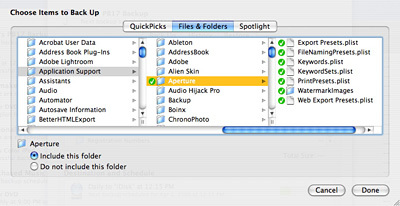 The Aperture presets are located here: Your Home Folder > Library > Application Support > Aperture. Simply navigate Backup to this folder and set up daily backups. That way you'll always have your latest set of presets available... no matter what happens. Adobe shipped Photoshop 1.0 in February 1990. The story of one of the original "killer apps" begins in Ann Arbor, Michigan (USA) with a college professor named Glenn Knoll. Glenn was a photo enthusiast who maintained a darkroom in the family basement. He was also a technology aficionado intrigued by the emergence of the personal computer. His two sons, Thomas and John, inherited their father's inquisitive nature. And the vision for future greatness began with their exposure to Glenn's basement darkroom and with the Apple II Plus that he brought home for research projects. What follows is one of the most interesting sequence of events in software history. When I was editor for a defunct online site called Web Review in 2000, I worked with Adobe to publish a "look back" at the development of Photoshop to celebrate its 10-year anniversary. The article was a big hit. But the folks who took over Web Review did the unthinkable and actually took many of its pages off the Internet, including the Photoshop article. Fortunately I was able to reconstruct it and posted it on Story Photography. It became the most popular page on the site. In fact, if you Google "Photoshop History," that article will be the #1 result. Even thought I've refocused Story Photography to concentrate on weddings and portraits, I've kept all of the original pages intact online with their original urls. I'll be pointing to some of them on occasion from here. Seems appropriate that I start with my article titled, From Darkroom to Desktopâ€”How Photoshop Came to Light. Take a look at it. I think you'll enjoy the story. What happens when you get three gregarious photographers together for chat about the state of digital photography including some of its most popular tools? Harris Fogel dares to enter these waters as he interviews authors Peter Krogh, Derrick Story, and Mikkel Aaland -- all at the same time in San Francisco. You can listen for yourself by visiting Mac Edition Radio and firing up this 20-minute interview. You can enjoy it right there in your browser, or download the piece and put it on your iPod. Either way, I'm sure you're going to like this conversation. Just in case you're not familiar with these authors, Peter Krogh wrote the The DAM Book: Digital Asset Management for Photographers, Mikkel Aaland wrote Photoshop CS2 Raw, and Derrick Story's latest books are iPhoto 6: The Missing Manual and the Digital Photography Pocket Guide, 3rd Ed. Even though I use Photoshop CS2, Elements 4, Aperture, Lightroom, and iPhoto 6, I like to play with new digital photography applications that are fun and useful. 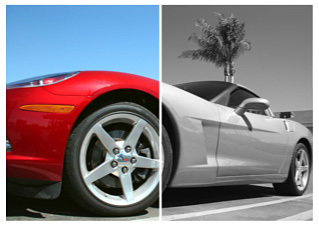 ChronoPhoto 1.4 is a joy to use and is the latest addition to my photography toolbox. There are times when I have a folder of images that I simply want to view; they could be working files of mine or something that someone else has shared with me. I don't necessarily want to add them to my Aperture or iPhoto libraries, I just want to enjoy the shots, look at the EXIF data, and maybe play a quick slideshow. This is where ChronoPhoto shines. It lets you work with a batch of pictures and stays out of your way while doing so. No long term commitment here, just a good time. And get this... it works as well with RAW files as JPEGs. 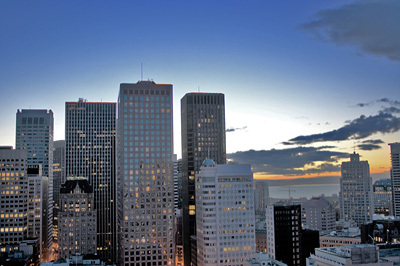 ChronoPhoto uses Dave Coffin's dcraw engine to provide RAW support for over 200 cameras. Basically ChronoPhoto decodes the images on the fly and lets you view their thumbnails and enlargements. The rendering of the images is absolutely gorgeous. You'll feel like a better photographer just by using this application. Plus you get loads of EXIF data for reference, and can add comments and mark your images too. ChronoPhoto keeps track of the originals on your hard drive. So you store your pictures where you want to store them. It has a "comparison" window called the Panorama that lets you look at specific photos together, then note your favorites with the marking pen. Simple, but effective. There are a couple of gotchas. I couldn't get the transitions option to work for the slideshows, so only basic cuts were available. Plus the slideshow doesn't automatically take you back to your thumbnails page after it runs; you have to hit the ESC key to do that. Other than those two minor nits, everything else ran smoothly. You can download ChronoPhoto 1.4 and try it free for 30 days. If you like it, you can buy it for $20 online. The company, Trois Bambous, is based in France, as is their distributor. My U.S. Visa card worked for purchase, but the Mastercard would not. Something to keep in mind when you're ready to buy. 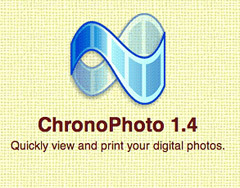 ChronoPhoto is for Mac OS X only. We've been talking a lot about night shooting recently, but morning light can be just as exciting. 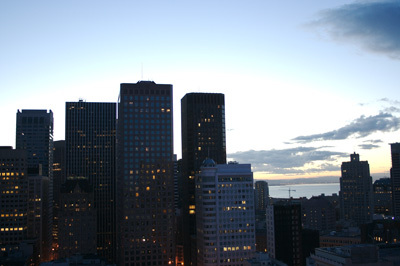 During a recent stay in San Francisco, I left my curtains open just in case there was a notable sunrise. Sure enough, early in the morning, someone slammed their door in the room next to me and I was awake. I looked out the window and saw this scene. Even though I wasn't really ready to get out of bed yet, I grabbed my camera and went to work. The picture, as it is displayed above, is how my eyes saw the scene. As we all know, how our eyes take in the world and how our camera captures it can be two different things. In order to record the image as I saw it, I used a technique called HDR -- High Dynamic Range. I'll be talking more about it in future posts and podcasts. But to give you and idea about how the camera saw the world, here's a "straight" shot without using HDR magic.